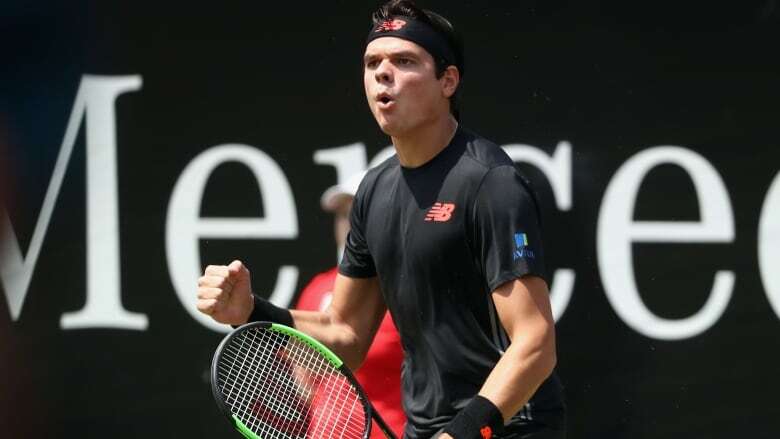 Milos Raonic beat defending champion Lucas Pouille 6-4, 7-6 (3) on Saturday to reach the final of the Mercedes Cup in Germany. The seventh-seeded Canadian will face No. 1 Roger Federer on Sunday at 4 a.m. ET. Canada's Milos Raonic has reason to be confident entering his first ATP World Tour final in over a year. He's coming off four straight-set victories this week at the Stuttgart Open and has beaten his next opponent — soon-to-be world No. 1 Roger Federer — in two of their last three meetings. Raonic's ranking has slipped to No. 35 as he has battled injuries over the last few seasons, but the 27-year-old from Thornhill, Ont., appears to be back in top form at the grass-court event. He dispatched defending champion Lucas Pouille of France 6-4, 7-6 (3) on Saturday. "It's a really positive step forward for me," Raonic said. "I've played good tennis this week. I've come back from not playing the last few weeks and I've come back playing at a high level. So I'm very happy with myself and I hope I can continue to improve my level again tomorrow." The seventh-seeded Canadian had 19 aces and saved the only break point he faced. "I haven't faced many break points so far this week," Raonic said. "I've taken care of my serve. I've done that part well. I've created some opportunities, I haven't always made the most of them but I'm keeping pressure on my opponents there. "All of that has paid off in tiebreakers. I've played well throughout those as well." The top-seeded Federer edged Nick Kyrgios 6-7 (2), 6-2, 7-6 (5) in the other semifinal. Kyrgios forced a mini-break in the deciding tiebreak, but Federer remained steady and sent a short backhand past the Australian on his first match point. Federer will be looking for his 18th career grass-court title. The Swiss star has a 10-3 in career head-to-head meetings against the Canadian. Federer, 36, won their quarter-final last year at Wimbledon while Raonic was victorious in their 2016 semifinal meeting at the All-England Club. Raonic also beat Federer to win the Brisbane International in January 2016. It was the last time the Canadian has raised a championship trophy. "The most important thing is going to be to focus on my game and if I can do my things well," Raonic said. Regardless of the result on Sunday, Federer will reclaim the No. 1 ranking from Rafael Nadal next week. Raonic, who has won eight career ATP titles, reached a career-high No. 3 in the world rankings in November 2016. He will be making his first final appearance since falling to Marin Cilic last June at the Istanbul Open. Federer has won two tournaments this season and has 97 singles titles overall.